Last week in Pakistan was eventful. By-elections were held. Former President Pervez Musharraf was indicted. Prime Minister Nawaz Sharif addressed the nation and laid out his plans. By-elections were held for 41 national and provincial assembly seats. PTI and JUI-F lost key seats, while PML (N), PPP, MQM and ANP did much better than PTI, JUI (F) and JI. Are KPK voter sending a warning to PTI to shape up? Former President Musharraf was indicted for Benazir Bhutto's murder. The indictment rests entirely on Mark Siegel's statement about Benazir Bhutto's fears. In a piece published this week in Foreign Affairs journal, UN Assistant Secretary General Heraldo Munoz looked at all the facts surrounding BB murder and allegations against Pervez Musharraf, and concluded as follows: "But all that does not constitute proof of culpability. Even Bhutto, despite her e-mail pointing a finger at Musharraf, did not believe that Musharraf wanted her dead--only that some people around him did." Meanwhile, most media commentators and pundits are playing up the fact that a former general has been brought before the court to answer. There is no discussion of the substance and merits of the case. At about the same as the former president was being indicted, a Gallup poll showed that Pervez Musharraf remains a popular figure with 59% of Pakistanis having a positive view of the former president. 31% favorable and 28% satisfactory.These high positive ratings of Musharraf are specially surprising given the hostility of the media and relentless attacks by the judiciary and the politicians against the former ruler. Sharif addressed the nation to talk about his plans to tackle economic crisis and talk with terrorists without insisting on a ceasefire. He also threatened to use force if talks don't produce results. Sharif also made the fantastic claim that Pakistan was on its way to "become an Asian Tiger" when he was removed in 1999, ignoring well-documented data showing that Pakistan was bankrupt and heavily indebted with a stagnant economy at the end of Sharif's last stint as prime minister. 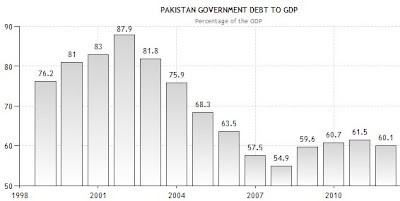 Sharif also talked about Pakistan's current debt situation as being worse than ever. This, too, is false. As percentage of GDP, the debt situation in 1999 was far worse. 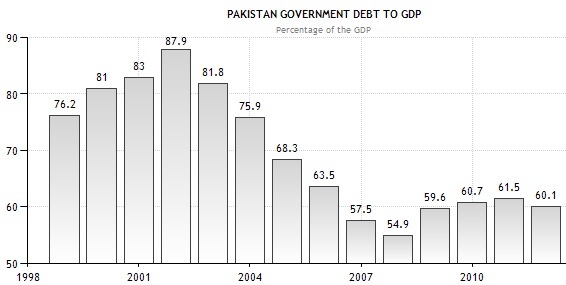 Pakistan's debt was 80% its GDP in 1999, worse than the current 60% of GDP, and far worse than the debt-gdp ratio of 55% when Musharraf left office in 2008. As to Sharif's reference to Pakistan becoming as Asian Tiger under his leadership, it's important to remember the historic fact that Asian Tigers did not become Asian Tigers under "democracy". Democracy came only after Asian Tigers became Asian Tigers. Are voters losing patience with Imran Khan's Pakistan Tehreek-e-Insaf (PTI) and Maulana Fazlur Rehman's Jamiat Ulema Islam (JUI)? Do MQM's big wins in Karachi under military supervision debunk PTI's earlier rigging claims in May elections? Is Musharraf's indictment in Benazir Bhuto murder case justified? Or is it a part of the continuing judicial vendetta against the former president? Will government inaction against the Taliban and their sectarian allies embolden them? Will democracy survive the terrorists' growing onslaught? Will the military stand by and watch Taliban take Peshawar and then move toward Islamabad? VPOS host Faraz Darvesh discusses these and other questions with Sabahat Ashraf, Ali Hasan Cemendtaur and Riaz Haq. PTI, JUI Losses and ANP, PPP Gains in By-polls; Inaction Against Terrorists from WBT TV on Vimeo. The strategy of Musharraf’s detractors was based on the assumption that he would never return and challenge them to prove their charges. When he did he caught them with their pants down and put many of them in the line of fire too. They had assumed that he was a coward like them and would never return except under a deal or pardon. One should be glad that Musharraf did return, as we need to separate truth from falsehood and expose those who would pervert it. The so-called treason case against Musharraf will be interesting too for it could rope in a prime minister, politicians, bureaucrats, generals and judges all acting holier than thou but are now quaking in their boots. (Did I use the word ‘rope’? A Freudian slip, I’m sure). In their eagerness to seem ‘emancipated’ they stand with the alien western electoral system that regularly throws up leaders who are from “the worst amongst us” and whose follies and foibles invite intervention. Musharraf’s detractors clutch at straws. The crux of the case against him is that he failed to provide adequate security to Benazir. It is not the job of the president to provide security. It is the job of the prime minister and the interior ministry if the capital is involved or the chief minister and home ministry of the province concerned. She was not only given all the security that a former prime minister should get, but more. If this were so Musharraf should be indicted in two more cases when as president he didn’t provide himself enough security and only escaped two massive assassination attempts that led to the deaths of many. Only God’s Grace and the stupidity of the terrorists saved him, not his own security. 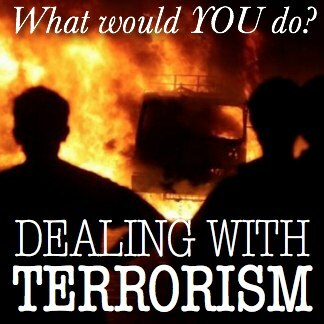 That he was president doesn’t dilute the ‘argument’; he is culpable. By this reasoning George W. Bush should also be indicted for failing to provide adequate security on 9/11. The global list is endless. It would become a circus. Benazir had repeatedly been warned by Pakistan’s intelligence and security agencies and also by foreign governments that there were serious assassination threats against her. Yet she returned before the date she had agreed to with the US. The National Reconciliation Ordinance (NRO) certainly was a huge error by Musharraf for not only has the country paid a heavy price for it as indeed has Musharraf but a terrible precedent has been set: if you are a big thief you are above the law, only small thieves aren’t. The Supreme Court has since struck the NRO down. Why is it not being implemented? It is said that the ISI chief visited Benazir at her Islamabad home that morning to dissuade her from attending the Rawalpindi rally, but she remained adamant. If Musharraf wanted her assassinated why would they have tried so hard to persuade her not to attend the rally? If they had placed her under house arrest Benazir would have raised an unseemly ruckus over being denied the right to campaign. The government was caught in a bind. Enumerating several economic indicators that have shown positive improvement, Finance Minister Senator, Mohammad Ishaq Dar said Pakistan would get about $12 billion in next three years from international financial institutions. The country would receive about $12 billion from International Monetary Fund (IMF), World Bank (WB) and Islamic Development Bank (IDB) during next three years, the federal minister said during a press conference here on Monday. "We have protected ourselves from any default and financially secured for the next three years for payments to lenders but there is need that we now focus on improving country's foreign exchange reserves," he said. Ishaq Dar said that $6.6 billion are expected from IMF which has called its board meeting on September 4 to discuss the issue keeping in view the progress in country's economy as witnessed by its management. He said that the country would also get $1.5 billion from WB this year as the bank has principally agreed to provide this loan where as $750 million and Euro 100 million (for trade enhancement) are expected from IDB through various schemes. Dictatorship does not necessarily result in development, defined by human well-being(which incorporates education, health, income, and safety from internal and external threats)and even by personal discipline. Furthermore, there is no conclusive evidence proving that either dictatorship nor democracy cause development. Nonetheless, we will prove dictatorships incorporate more control over the variables that define development so in consequence are a better course to get to it. Also, that dictatorships guarantee the Social Order, which is a very necessary prerequisite for any kind of economic accumulation process to be feasible. A form of government in which absolute power is concentrated in a dictator or a small clique, dictatorships are subject to retaliatory actions. We propose this should end. Democratic nations should not take retaliatory actions against dictatorial governments in order to diminish their legitimacy, their power, and to promote their overthrown in exchange for a democratic alternative. This actions account for the diminishing of economic & diplomatic relations with Burma and Iran and the cut of economic aid to Honduras’ “de facto” Government. We will prove that these sort of actions can only undermine the possibility of development finally kicking in this countries, since dictatorship is the best way to achieve it. Dictatorship is a more economic institution: elections are a luxury reserved for developed countries. "He's a dictator! A judicial tyrant!" said Abid Saqi, the president of Lahore's high court bar association, a powerful body representing 20,000 lawyers that in July called for the chief justice and two other judges to be charged with misconduct. Saqi added: "He has destroyed the judiciary as an institution and destroyed the constitutions as a sacred document for his own personal aggrandisement." Until recently few dared to speak out at all, let alone use such colourful language. That was partly due to Chaudhry's immense popularity – a 2011 Gallup poll found he was the most popular public figure in the country. So far, the changes in the syllabus have not been finalised, but media reports suggest that some of the recommendations include re-inserting Quranic verses on jihad for grade nine that the previous government of the Awami National Party (ANP) had excluded from the syllabus. The loudest criticism to Shah Farman’s statements has come from the ANP’s Bushra Gohar, who accused the PTI of having a pro-Taliban agenda to radicalise society by imposing on it the jihadist narrative through the education system. (Shia) Militia groups have been accused of a plethora of human-rights violations, including mass shootings of prisoners and Sunni civilians and the forced displacement of Sunni families on a scale approaching ethnic cleansing. Shiite fighters boast about executing enemy soldiers after they surrender. In Jurf al-Sakher, some Al Qara’a members hurried out of a meeting with a reporter for The Wall Street Journal to deliver the severed head of an Islamic State fighter to relatives of a slain militia member before his funeral ended. In official Iraqi media, militias are celebrated as heroes, and their leaders make televised victory speeches next to Iraqi army generals. One of the deputies to Hadi al-Ameri, leader of the Iranian-backed Badr Corps, recently was elected Iraq’s interior minister. He oversees police and a government office responsible for monitoring militia groups.